It is incredible how much things can change in just a month; August has been an extreme example of this for me here in Jamaica. Leading into August, the previous volunteers took us under their wings and introduced us to our missions. I watched each of them in complete admiration of all that they had accomplished this year, and couldn’t help but wonder what the coming year would hold for me. Steve was my guide as I learned my way around Dunsinane, Mike Town, and Lincoln (three of the areas I will be working in this year). I could not have been more thankful that Steve was so excited to introduce me to everyone and show me the ropes; his enthusiasm melted many of my anxieties about taking over what he had begun. Of course, this overlap transition period couldn’t last, and on August1st we said good-bye to Jen, Steve and Michelle. In my mission I also said ‘see you later’ to Father Peter, the priest in charge of my mission, as he left for his month-and-a-half vacation back to Kenya. With both Steve and Father Peter gone, I had no choice but to dive right in and hope for the best! After our two-week stint as bible camp teachers (to 22 students between the ages of 15 and 18) I felt tired, but also more capable of tackling my own mission for a few weeks by myself. My first day out doing home visits proved to be a true taste ofJamaica. I had started the day planning to go to Mike Town and meet up with a family there. When I couldn’t get a hold of the mom (who I needed to meet me at the road to give me directions to her house) I decided to fill my time with the other houses I knew I could get to. First was Ma Shirley, a 91-year-old man who lives with his son, daughter in law, nieces and grandchildren. The last time I had visited him with Steve he was in pretty bad shape, his diabetes and heart problems were taking their course, and he didn’t have much of a fight left in him. As I walked into the house things were quiet. From down the hall in his room I could hear someone sobbing, yet one niece motioned me forward. As I turned the corner to his room the scene did not look good, his daughter-in-law, (and primary care giver) was crying on the floor next to his bed where he lay motionless. My heart sunk for a minute as I realized what I might have just walked into. Ma Shirley’s son came in a few minutes later and explained that he was ok for now, but things didn’t look good. I asked if there was anything I could help with, hoping to feel more useful in this difficult situation, but already knew the family was doing everything that could be done. I stayed for a while, holding Ma Shirley’s motionless hand while his daughter-in-law gave him some juice. We talked about his condition and I told her what an amazing job she was doing caring for him. Unsure of what else I could do for them, I offered to pray. The daughter-in-law eagerly grabbed my hand and we all closed our eyes and bowed our heads. I finished the prayer and hugged the family as I left. I got in the car and called a priest to come give Ma Shirley his last rights, but couldn’t shake the feelings of sadness and helpless. It wasn’t until my return trips to Ma Shirley’s house that I realized how much my accompaniment and prayers had meant to the family. Ma Shirley has beautiful blue eyes that seem to kindly peer right into your soul, communicating everything that he is feeling in a single glance. On another trip to his house just as I was leaving, in an unusual burst of energy he reached out, took my hand and shook it side to side. As he did this, he looked me right in the eyes and smiled warmly. Instantly I felt like I had done something for this man, and that although he didn’t have the energy to tell me; he was happy I had come to see him. I’ll never forget that moment with Ma Shirley. My next stop on that first day wasLove Lane, a neighborhood just outside Greenvale (one of the roughest areas in Mandeville). As you drive in the unpaved road, you can’t understand who would have named it “Love Lane” – the houses are falling apart, and the junk-filled yards look less than inviting. The family of seven that I was going to visit lives in a two-room house with three beds and no indoor plumbing. 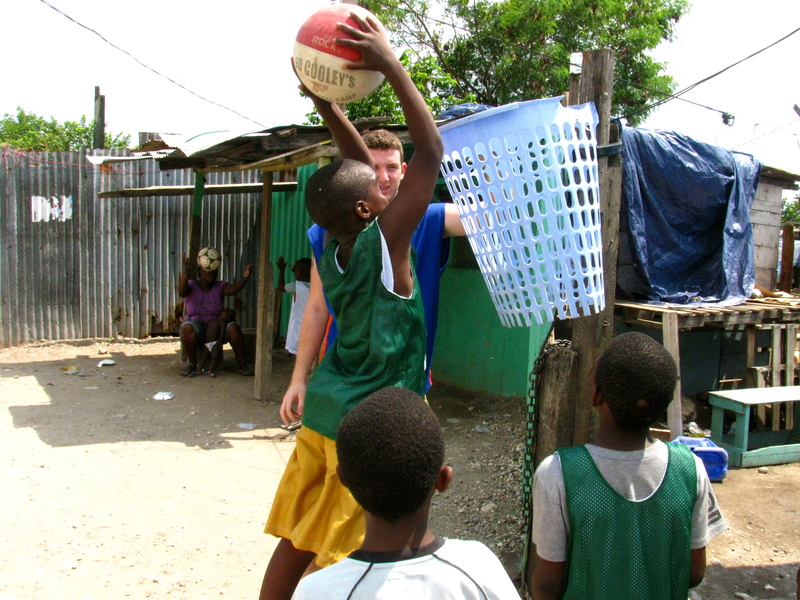 Despite the harsh conditions that the children live in, they are bright, beautiful, and energetic little souls. Moesha is the first one to see me coming. With the car windows rolled up I can hear her shout my name and her little brother echo. The two of them bound down the hap-hazard cement steps out of their house and launch off of the bottom step (a solid three feet above the rocky soil of the yard). I quickly exit the car and close the door before they come crashing into my legs. They climb up to give me hugs and kisses, letting me know how happy they are that I have come to visit. As we make our way back over to their house, their mom helps the one-year-old brother down the steps in his oversized flip-flops. He squeals with a crazed look of happiness in his eyes and reaches out for me. All I could think to myself was, ‘I can definitely do this everyday’. I had known this family for less than a month, and they already accepted me and made me feel more welcomed than I could have ever anticipated. The rest of the day was a series of games and arts and crafts. The reality of the family’s situation really struck me again when the two little boys started eating the crayons I had given them to color. The mom didn’t stop them, and although my gut instinct was to pull the crayons away from their mouths, I realized that they had probably not eaten anything yet that day. Father Peter had talked to me previously about this family and many others that struggle to get food for their children. These kids are lucky if they get one meal a day, and a bag of cheeto’s is the most I’ve ever seen in their house by the way of food. They are surviving on so little, yet they still exhibit so much love and compassion for each other. When they do have food, they are incredibly aware of how much each sibling needs and receives; the older ones dole out the portions to the younger ones first before helping themselves. Playing with them is the least I can do to distract them from their worries, and let them be the children they (like any child) deserve to be. In return I am blessed enough to witness their unconditional love and be reminded of what it really means to be brothers and sisters. My Mike Town contact never pulled through that day, but it was no problem to get to spend the rest of the day in Love Lane. On the drive home, I reflected on the rollercoaster of emotions that I had observed, and shared in just one day. Since that first day I have become much more comfortable going on house visits by myself. The nervousness and hesitation that I started with has gradually grown into confidence in myself and in what I will be able to accomplish this year. That confidence and reassurance was reinforced even further this month by my long awaited trip to Riverton City in Kingston. 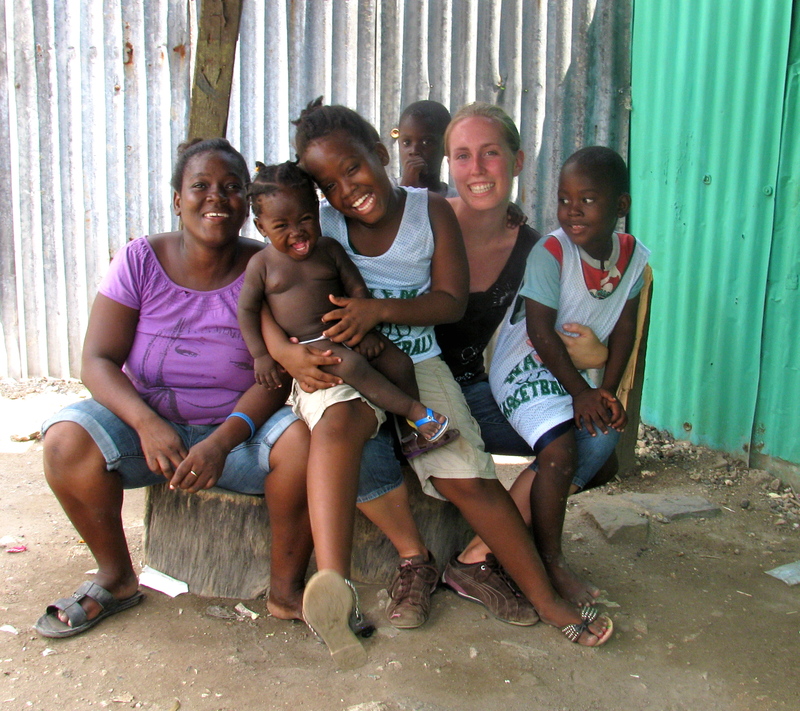 I first came to Jamaica with Fairfield University in January 2009 on a service trip. One of the sites we worked at was a small school in Riverton – a neighborhood built on top of theKingstondump. The conditions are arguably among the worst in the country; the poverty is extreme and the gang violence is rampant. Most people here in Jamaica shift uncomfortably when you mention Riverton; afraid of the stories they have heard. For me, Riverton is a very different type of place than what meets the eye: it is where the little girl that I have been sponsoring for the last 7 years lives with her family. When I first came to Jamaica with Fairfield, by some miraculous twist of fate, I found this little girl and got to spend two days with her! The last two years I have come back on winter break to visit Riverton. This incredible little girl (named Shanoy) and her wonderful family are the reason I first fell in love withJamaica, and certainly a major factor in my applying to PVI Jamaica. I have been anxiously waiting to go and visit her since we first arrived in June, and couldn’t have gotten there fast enough the other day. Sean came with me (also having spent time there with Fairfield) and the day was amazing. We brought games and crafts, yet these kids always come up with the most creative ideas with the scraps they have found lying around the dump. This time we tied a bottomless clothes hamper to a post, using an old leather belt, and started a neighborhood game of basketball. Playing with Shanoy, her siblings and cousins, I felt right at home. It was a complete miracle that I found her in the first place, and every time I am blessed enough to visit her and her family I can’t help but feel like I am exactly where I am supposed to be. Although it is a good drive from Mandeville, I am dedicated to making a trip out there once a month. Going to Riverton provides me with a perfect reminder of why I wanted to come toJamaicain the first place, and gives me hope to create more of those spaces for myself within my own missions. As September begins I could not be more energized and excited about what lies ahead. Instead of those nervous, unsure feelings I began with, I now feel empowered and capable. School is starting next week, and there seems to be an infinite number of possibilities for this year – after all, look how much has come out of this month!